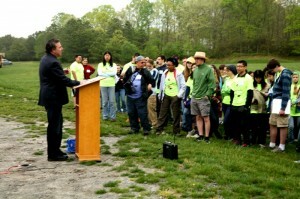 Share the post "Sciarappa Keynotes New Jersey “Envirothon”"
At left, Bill Sciarappa addresses students participating in “Envirothon” in Howell, NJ. Bill Sciarappa (agriculture and resource management agent, Monmouth County; department head) was the keynote speaker at the 19th annual New Jersey Envirothon, a natural resources problem-solving competition held May 5 at Girl Scout Camp Sacajawea in Howell, NJ. 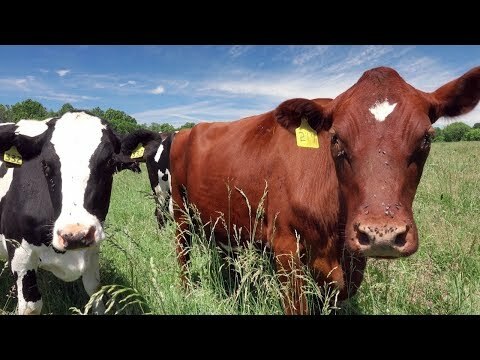 Over 165 students, drawn from 33 high schools across New Jersey and accompanying staff participated in the event which is meant to promote environmental awareness and possible careers in agriculture. Sponsored by the N.J. Department of Agriculture, the competition was titled “Nonpoint Source Pollution/Low Impact Development.” It included six learning stations that included soils, forestry, wildlife ecology, forestry, and current environmental issues. Among those managing the stations was Sal Mangiafico (environmental and resource management agent, Cumberland and Salem counties) along with staffers from NJDA, DEP, FSA, NRCS, Freehold Soil Conservation, and watershed groups. Richard Belcher, who serves as the agriculture department’s conservation education coordinator, organized the Envirothon, which was won by students from the Marine Academy of Technology and Environmental Science (MATES) in Manahawkin. The winning team will represent New Jersey in the 2012 Canon Envirothon at Susquehanna University in Selinsgrove, PA, in July. The Envirothon is sponsored by the New Jersey Department of Agriculture, State Soil Conservation Committee; New Jersey Association of Conservation Districts; the 15 Soil Conservation Districts; United States Department of Agriculture, Natural Resources Conservation Service; New Jersey Department of Environmental Protection; and Rutgers Cooperative Extension. Read more.